The March MAGNE-BOOST Hydronic hot water booster pumps are a non-self priming unit built to handle liquid transfer in heating and cooling operations. Typical applications include home heating systems, solar heating systems, heat recovery systems and recirculating water in domestic and commercial hot water tanks. 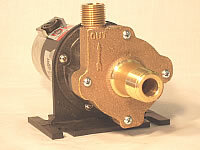 • Brewery pump - The Plastic or Stainless Steel March 809 and 815 series of pumps are commonly used by Home Brewers and Breweries. The Plastic and Stainless pump models use FDA Food Compliant Materials. • Maximum liquid temperature for the 809 and 815 series is 250 F.
• Port configurations include in-line OR center inlet with side discharge. • Construction materials: Bronze, Stainless Steel, Ryton/Polysulfil Plastic. Impellers are Teflon plastic. • There are many motor options available Including AC, DC and High Speed versions for added flow. Power cords are included only on AC models as noted. AC Models without power cords have a conduit box. DC Models have wire leads.